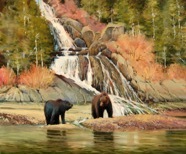 In 2007, Niles and three other artists, Greg McHuron, Robert Hagberg and Richard Iams, painted Alaska's Inside Passage from Ketchikan to Sitka and Glacier Bay. They spent six weeks aboard a 42 foot Nordic Tug painting rarely visited areas including Misty Fiords National Monument, Ford's Terror, Hobart Bay, and the Anan Bay Bear Station. This once in a lifetime adventure provides Niles with a continuing series of paintings.